The Florida Legislature recognized the importance of coastal plant species. Therefore Florida law states that no person, firm, corporation, or governmental agency shall damage or cause to be damaged sand dunes or the vegetation growing on the dune system (subparagraph 161.053(2)(a), Florida Statutes). Consequently, it is the policy of the Department of Environmental Protection to protect native salt-tolerant vegetation and endangered plant communities. Property owners or their agents proposing to alter the native vegetation seaward of the Department’s Coastal Construction Control Line must apply for a permit if the alteration can be expected to damage the plants. What does this mean to landscape professionals and homeowners? If you are maintaining an area along the coast that could be considered a sand dune or part of a dune system, STOP! And then…. If it is a native species leave it alone. You will need a permit to “alter” the vegetation. Why does it matter? In a word, light. 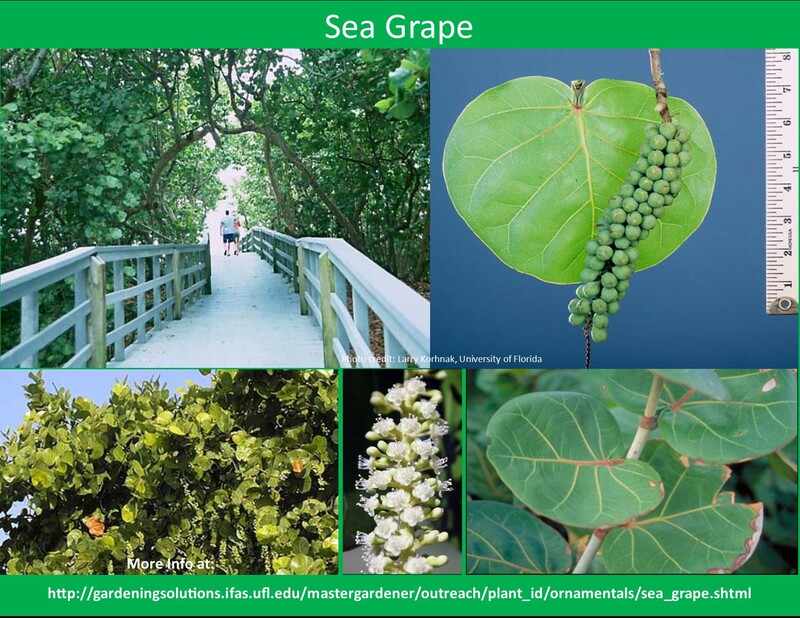 Sea Grapes can block artificial light. Artificial lighting trespassing onto sea turtle nesting beaches affects sea turtles in two ways. First, artificial lighting deters adult females from emerging from the surf to nest. Secondly, hatchling turtles find their way to the ocean by orienting toward the brightest horizon. On a natural beach, this is the horizon over the ocean. The dark dune silhouette behind them keeps them from heading in the wrong direction. Hatchling turtles are highly sensitive to even minute quantities of short-wavelength or white light and will orient toward the brightest direction. For questions in Manatee County email Michelle Atkinson or call at 941-722-4524 x1818. Current Landscape Professional classes can be found here.